STAFFORD – For as close as they are off the track as friends, it’s been most common on the track this year that Marcello Rufrano and Bryan Narducci are usually even closer on the track during SK Light Modified features at Stafford Speedway. The battle for wins and the season championship for the teenagers in the division this year has been waged through aggressive racing by both, of times between them. Sunday at Stafford the championship battle between the two came to a crushing ending before the checkered flag fell on the 20-lap SK Light Modified feature. 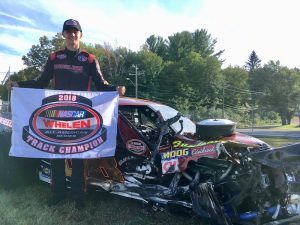 Rufrano celebrated his first SK Light Modified championship at Stafford after a lap 17 crash between he and Narducci while battling for the lead ended the day short of the finish for both of them. Rufrano and Narducci came into the event tied at the top of the SK Light Modified division standings. The driver that finished highest in the final running order was going to claim the championship. Despite the fact that Narducci was leading the race when the accident happened, Rufrano was leading for the previously completed lap before the caution came out for their wreck. Rufrano was credited with a 19th place finish in the 27-car field. Narducci was scored 20th place. It gave Rufrano the championship by two points. Rufrano ended the season with six victories and 11 top-fives in 21 starts. Narducci had five wins and 15 top-fives in 21 starts. After some struggles to get the race going, it was a lap 11 restart that set things on fire in the championship battle. Coming to the restart Rufrano was fifth in the field and Narducci sixth. At the green Narducci used the outside lane to fire up through the field and move to second, with Rufrano finding the line to follow Narducci up to third. On lap 13 it was Narducci going around Glen Griswold for the lead off of turn two with Rufrano following to second place. On a lap 14 restart Narducci held the lead. A lap later Rufrano took a peek low but couldn’t find a lane before another caution flew on lap 16. On the lap 16 restart Rufrano got a huge jump and went the lead. But coming off of turn four Narducci was able to get a run and regain the lead. The mayhem began through turns one and two on lap 17. After contact between the two through the corners, Rufrano slammed sideways into the backstretch wall, but remained going forward. Going into turn three Rufrano’s left front made contact with Narducci’s right rear. The contact sent Rufrano’s jerking hard right and head-on into the wall. Narducci’s car took a much soft angle, but ended up in the wall closer to turn four. Narducci said Rufrano should have been penalized for what happened before the accident. “Obviously the race director likes him more than me I guess,” Narducci said. Rufrano said he had no control of his car when the contact that was made that sent both to the wall. When the 01 drove the 88 up the track on the last lap a few weeks ago did the 88 whine, no. Did the race director play favorites to the 88 then, no. The 01 claimed he was invoking the spirit of T.C on that race, you are no T.C. Maybe the 88 was invoking T.C. this race and you did not like it (most did not like appreciate what T.C. did to them on the track). Congrats to the 88 on the championship. P.S. did Kyle James whine when your mentor (81 SK) blocked the track at Waterford when you were the spotter? No. Get over yourself, Try again next year. I do think you have tremendous talent and will be a top contender next year; just stop whining., we think you are much better than that; prove it in 2019 on the track and with your comments. You have one of those deals where the right decision given the rules results in an unfair decision on the champion. And the fans, the two friends, the track officials seeing a result that just was not the way the season should have ended given what we saw in this division during the year. That all said the ending was dramatic, unexpected,exciting and what other division went down to the last laps with the championship on the line. SK’s rule but the Lights are the most competitive. The races I attended these two guys were always together at the drivers meeting. This should not be much more then an blip in their respect for each other after the adrenaline wears off. At least one would hope. Thanks to all the SK Lights for one of the best seasons ever in any division. CONGRATULATIONS to Marcello Rufrano on winning the 2018 SMS SK LITE Championship. Hope your ok after what looks to be a nasty wreck. Hey, when you are coddled in racing and thing’s don’t go your way you WHAAA WHAAA! STOP with the TC’ stuff and start using your HEAD on the track! 01, 2 week’s ago if you were smart you would have realized that a rookie is in the 14 and you would think about the word CHAMPIONSHIP but NO you raced like you allway’s do and the rookie and you wrecked and there goes your point lead. Time to stop Whining all the time and drive with probably the most God given talent of any kid out there! Stop being a sore sport! CONGRATULATION’S to the 88 team and they won it mind you with one less race. Bryan Narducci and Marcello Rufrano ran the same number of events. Rufrano had thought he was going to miss an event while on a family trip to Italy but that turned out to be the one week this season that Stafford rained out. Invoking TC?? Get off this TC garbage until you are actually smart with your race car. You have a lot to learn and it showed this whole season. There has been numerous wrecks that look like the front wheels were pointed the wrong direction or half the car was in the dirt which is clear as day on video. Leave the Dukes of Hazard show boating at home until you learn how to race. Marcello had the racing gods in his favor this year with a timely rainout and the 01 acting like a bull in a China shop. Congrats to him. The 01 has skills but it he needs to back the truck up and learn how to use them more effectively and safely. The 01 did it to himself. Not just yesterday but in many races this year. Not denying he has talent, but kid you are no TC. You make some pretty stupid on track decisions with your reckless driving which cost you the Championship. I didn’t hear the 88 whining when you drove him up the track a few weeks ago. Boohoo cry me a river. It has nothing to do with the race director liking him more than you but if you need to use that as an excuse instead of admitting the fault is all yours – hey whatever helps you sleep better at night. Lets call apples ,APPLES,And oranges ,ORANGES,.Narducci is a Spoiled rotted little punk,with no respect for anyone on track.Going to learn a leason the hard way i guess.Track needs to stop swelling up this kids head,he is a little better then adverage driver,that is it.Just calling it ,what it is.He is no TC.The track and announcers,media need to STOP ramming him down our throat.YES we get it.STOP<STOP,STOP for gods sake.Find someone else to talk about. I think you are totally rude about the comments you are saying about the 01. Hope karma back at you someday for being disrespectful to MS patients. The 88 is spoiled daddy pays for all his needs. The rest of us work and pay for our own equipment and repairs racing with people like the 88 14 35 54 daddy pays their bills. Tinat I did see the video and I saw the race. I saw the 01 hit the 88 going into four. I saw the 01 run the 88 up the backstretch after making contact with his left front, bouncing him off the wall. At that point, it’s safe to say the 88 had significant right side damage because it wasn’t a light hit. His right front was flat before he hit the 01. The right rear looked like it was going down, too (watch the video). We can’t see the left front but having no control of the car at that point, i would say it was flat as a result of the hit by the 01. Not a fan of either driver really. But the constant talk up of the 01 by the announcers gets sickening after a while. Just like blind as a bat says, he is no TC and the fact that he thinks he is or even close to being TC, is more sickening. Why bring in the MS thing.I was treating him just like any other driver.And hope he would want it that way. Not that it has anything to do with anything, but, Bryan has cerebral palsy, not MS. Thank you Shawn for correcting me my apology I was told different few yrs back. If you can delete it that would be fine otherwise my apology. But don’t have apologies for the haters. I have to kind of agree, the 88 is surelly no victim here and I’ve looked at the video several times, that RF looked fully inflated to me… He over drove it into 1 & 2 and took out the 01 after he hit the backstretch wall. I’m not fending for the 01, it’s just my opinion. As far as moving up I saw he tried ridding up on the 2 several times in the SK race and we all saw how that ended for him. At blind as a bat exactly parents pay cuz their teenagers. They don’t care who they wreck when racing cuz they dont flip the bill so maybe should be a little more respectful. When they have to pay they will see how it’s not so easy anymore to afford to fix wrecked race cars. Obviously u don’t know much about the off track side of it. Other commenters have summed up the 01 perfectly. “bull in a china shop”, “reckless”, “start using your head. ” Every week we just waited for the next foolish move from him, and who might be the innocent victim of one of his dive-bomb, bump and bang stunts like the one that put the 88 into the backstretch wall to start that whole final crash on Sunday. As far as the incessant, insufferable, and simply, sickening promotion of the 01 by the track’s announcers, it’s very obvious who they like. Yeh, there’s no impartial announcing at this track. Those simple-minded carnival barkers spend way way too much time trying to give us their decidedly personal opinions of their favorites and not enough time actually dispensing useful information to to the fans. And whether a driver has MS, cerebral palsy, two heads, or one arm doesn’t excuse their lack of sportsmanship or give them the right to drive like an idiot with total disregard for the other competitors. Anyone who really want’s to know what happened just go to the 01 face book. You will plainly see 01 turn into 88. way to tell on yourself kid by posting your go pro video. Anyone ever see a car take a hard left after bouncing off the outside wall? Because I have. Sunday’s Sk lite race was a good show until that mishap. Two spoiled Rich kids with no respect for each other or each other’s equipment or any body else’s. Love to see a young Bugsy or Ronnie or Richie show these young boys a thing or two. I never was a fan of if you can’t win then wreck them. Ever seen two kids wreck each other trying to win a championship and tear up thousands of dollars in equipment in the process? YEP!!!!!!!!!! Oh well, possibly two less cars for the world series……………. No different than the 51 and 77 at NH. Both going for it!!!! Man are the claws out in this thread. I don’t know if any of these kids are rich and spoiled. I do know it’s self defeating to make generic insulting comments about young kids being given rides by parents, extended family and friends. A huge percent of the guys and gals racing fit that description so if you want them to get a job first and really earn it then just say you want to end local racing. Are the SK Lights a wreck fest? During the last 10 race events 80% of the cars finished the entire race. In the SK’s the number was 71%. The 80% includes equipment failures as well as wrecks and looks pretty darned good to me for a division with a lot of inexperienced drivers. They also had several green to checker and one caution races so there’s that. Are Narducci, Rufrano or Bakai who took some heat in a race he won menaces? For what it’s worth Narducci had 5 DNF’s . Rufrano and Bakai had 2 each and again the numbers includes equipment failures and wrecks so I don’t know if that really says anything. Narducci appeared in the top five 15 times compared to 11 by Rufrano and 14 for Bakaj. Drivers playing bumper cars generally don’t turn in those numbers in big fields where each of them started deep in the field more often then not. For my money they all had their moments where inexperience showed but maybe that’s because Narducci and Rufrano especially are young and inexperienced. All completely within acceptable standards for a learning division, the last race antics not withstanding. Was Narducci’s comment of favoritism ill advised? You betcha and I’ll bet he wishes he could take it back. Do the race announcers try to push human interest stories. Of course. The idea is to engage new fans so they’re going to be tedious repetition for the regulars. Thanks Lights for one of the best, most competitive, most dramatic seasons ever recorded at Stafford in a support division. Finally got to watch my video last night. To those who are saying Rufrano’s right front still had air after the backstretch wall contact, they are correct. However, it looks like it was hanging on by maybe only the safety tether, as it was just bouncing along next to the car. It looked to me like he was fighting to get it off the wall, but could not correct quick enough (with only partial control of the left front, and probably not much in the way of brakes) to avoid hitting Narducci. Rufrano’s right front went flying in turn 3 because it was already detached from the backstretch encounter. The turn 3 contact looked more like a racing deal to me than anything intentional. So it was ok for Rufrano to race a sk lite and sk on the same day. Surprising no one is crying about that. Opinions are opinions, but it looked pretty obvious to me the 88 tried to hook the 01 after bouncing off the backstretch wall. I don’t buy the “had no control of the car” claim. The car straightened out, then aimed towards the 01. And casual observer has issues with the 01’s airtime on the PA system.. It’s the announcer’s job to sell, entertain, and grab attention of the audience. Like him, hate him, spoiled, out of control, whatever it is – I don’t think there is a more exciting driver in that division with such an interesting background story. Yes Hillary, racing two divisions is perfectly fine and legal at only the Fall Final at Stafford. A street stocker could race an SK if he wanted then the tour too. Now that you mention it Andrew Moeller raced the SKL and the Tour I believe Sunday at the fall final. Earlier in the year he also raced the open modified show and I’m guessing he also raced the SKL earlier in the show as well, I’m not sure. The bottom line is that is legal and not an issue, just an interesting tid bit of information brought forth. Had that same thought so I dug through the rulebook. It is legal to run both only at the fall final. Perhaps to prep for next year. As I understand it Rufrano in the break between the SK Light race and the SK race officially moved up a division. No waiting period required and no crying needed.